I've been a bit overwhelmed as of late researching bike geometries, qualities, materials, and what have you. I'm always curious as to what other people think, and even more curious as to why they think what they do. Folklore is a mighty powerful beast, often overpowering even the mightiest of bike gurus. The strongest of them always come down to a few: aluminum is a harsh ride, steal is heavy, and carbon fiber doesn't last more than 5 years. I'll admit I've sort of bought into these tales to some degree over the years, but probably not to the degree that say most consumers think all Trek bikes are good because they are Treks. Well actually no, most of them are junk in fact. So I've taken it upon myself to do some more research mostly for a friend, but also for the day that I can actually afford a nice light road bike that fits me snugly, or that sick Titanium XC mountain racer. For now I've stumbled upon a series of articles called METALLURGY FOR CYCLIST by Scot Nicol who founded Ibis Cycles. and toe. They say idle hands are the devil's playground. I'm not sure who they are, but they may have something going. At least somewhere along the line turning right or left inevitably brought me to here, and here just happens to be a clutter that never seems to let up. 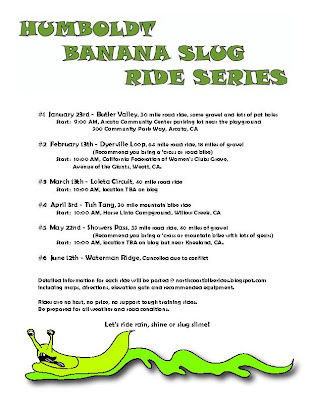 I find myself starting to think about the weekend, in particular the Banana Slug series ride down in Dyerville this Saturday. ...so it's 64 miles, 18 miles of gravel. What tires do I ride? Will they fit on the roadie, or do I ride the heavy tourer? And when will I have time to work on my bike? I've got to head down and get my new driver's license at the DMV and I don't even drive. For some reason we are pressured with all these social inconveniences whether we even want to drive or not. Like it's illegal to not carry around an id. Well I tried to, but your damn camera was broken and you were unable to process id's or DL. And your "system" is so out of date that I can't take the stupid written test, pay my fee, and come back tomorrow for my mug shot. it simply "shuts the system down." Well they are going to stop me. I'm not spending the start of my 33rd year sitting in their overgrown lines with disgruntled customers. With this dang sinus infection I'll probably end up sleeping until noon and trying to heal while I play with my new bike light. I bought the Magicshine 900 at Geomans bike stuff. I just recently heard about the popularity of companies putting an SOS mode on their lights. Not that it takes any incredible circuitry enhancement to add a few blips and dashes, but I do think it is a novelty that will soon fade away. If you're unfamiliar with Morse code I recommend you google it. Without a doubt you'll come to a wiki page about the Morse Code translations for English numbers and letters. I say English because I'm out searching for a 4 dash letter that doesn't seem to be part of the Morse Code translation. Either someone who is making Geoman's Magic Light 900's is playing a funny joke, or QC/QA completely should be fired over there in China. On SOS mode I should be brillianced with a dot-dot-dot dash-dash-dash dot-dot-dot. Well this is one ship that isn't getting rescued. My 3 middle dashes are 4, and I'm left on the island while some rescue boat moves along because of my confusing message. Either way, I'll do a product review once I get the thing mounted and the infectious being from my nasal cavity retreat. I did manage to get 1 ride in this last week. Yup sad week when you only get 1 ride in. The little voice in my head is screaming, dude the TUC is going to tear you up. I guess I've always been a masochist, finding myself in places I probably shouldn't be. It would just be nice to suffer for 6.5 hours instead of 8. 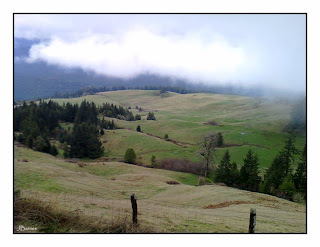 This is a taste of the Bald Mountain ride. Mostly paved, but has some dirt/gravel sections. The only soft spot was right at the junction of Snow Camp Road and Bald Mountain road where it starts off with some steep grades. If ever a guy felt proud of where he lives it would be at a point really similar to this. A lot of people I know, most even, hardly ever ride, or never ride a bike. I'm all for everyone having their own sort of thing going on. It would be, at these moments, the time I would probably say something like, "now that's what I'm talking about." 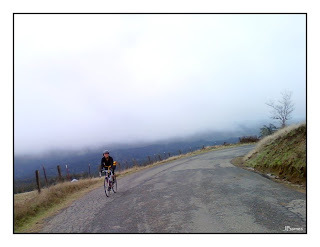 And then turn around and suffer some more climbing.